Caithness, the most northerly county in mainland Britain, is one of the richest cultural landscapes in Europe. The relative geographical isolation of the area, traditional landholding and the survival of large estates, combined with the use of flagstone as the main building material since earliest times, has ensured the survival of a wide range of monuments in a profusion unequalled elsewhere in Scotland. 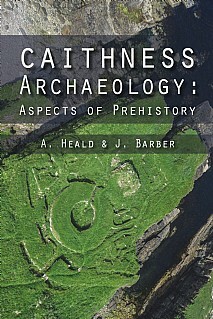 In the 19th century, Caithness was at the forefront of archaeological endeavours with many sites central to our understanding of Scottish prehistory. Since then, despite intermittent activity, the archaeology of Caithness has become somewhat marginalised and there is a perception that there are only a handful of archaeological sites for visitors to enjoy and the archaeologist to uncover and interpret. However, the county is full of hidden riches and traces of the past are visible everywhere. Caithness is dominated by landscapes rich in archaeological remains of all periods; chambered cairns, stone settings, brochs, Pictish settlements, wags, castles, harbours and post-medieval settlement, amongst many others. The authors have presented a cross section of these monument types in an attempt to re-centre the county in archaeological and early historical narratives. For the last decade, the authors have been involved in a range of heritage projects in the county, thus allowing them time to discover, observe and consider its archaeology. Their peregrinations provided opportunities for deeper contemplation of the county’s archaeology, the result of which is presented in some new interpretations and perspectives which convey the excitement of working on heritage in Caithness. This will be of great interest to all archaeologists, from enthusiasts to students and professionals. It will also appeal to visitors who are interested in the archaeological heritage and history of the county.